A disappointing story from New Zealand but one which the statistics would seem to bear out. I have a theory that because Pacific Islanders were a people that spent a long time at sea moving from island to island, the food store they took with them for the journey was their body fat that was burned off during the journey. 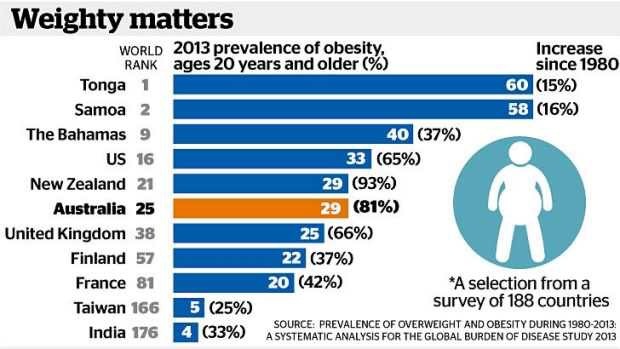 It’s the Pacific Islands that regularly top the charts of the most obese countries. Maybe these islanders have developed genetics that favour fat storage (even more than you or I!) as a necessary means of survival in the past – that is now killing them today. The Guardian has been running a series on Mexico which, amongst other things has covered Mexico’s huge, and growing, obesity problem. Mexico was the first country in the world to recognize the important role that sugar, particularly in the form of soft drinks, plays in the develpment of obesity and diabetes. This article describes the sugar tax that Mexico has levied in an attempt to reduce the consumption of sugary drinks and foods. Mexico is well on the way to coming the fattest county in the world and its 2006 health survey revealed that the prevalence of diabetes, the countries biggest killer, doubled between 2000 and 2006! The health survey also showed that soda intake had more than doubled among adolescents between 1999 and 2006, and nearly tripled among women. The then Mexican secretary of health – José Ángel Córdova Villalobos – decided that the situation could not be allowed to continue and asked the leading Mexican nutritional scientist – Juan Rivera, the founding director of the Centre for Research in Nutrition and Health at Mexico’s National Institute of Public Health – to help him solve the developing crisis. His recommendation was simple, reduce the consumption of sugary drinks. However, the article makes the same point I have made many times before, that exercise is ineffective for weight management. You simply cannot burn enough calories off by exercise to make any impact on your weight and in fact the fitter you are, the SLOWER you basal metabolic rate will be, and fewer calories will be needed just to keep you ticking over. You cannot out-run a bad diet. Furthermore, as William Banting discovered in 1863 (see previous posts), exercise increases the appetite and encourages you to eat more. Really? How is that then? Mexico City dwellers can acurately remember how much exercise they take but not what they have eaten? The author then uses the article to argue that it is the urban environment that is a prime factor in Mexico City’s obesity explosion and that if only the environment could be redeveloped to encourage physical activity, then exercise would simply take place and weight loss would occur. I am not so sure, but then I am a Personal Trainer and I know about exercise and losing weight, whereas she is an economist whose research focuses on public health policy and urban development. But without citing anything that would support this statement although it looks strikingly similar to what the soft drinks companies are saying. Anyway, I am going to Wahaca tonight for a lovely Mexican dinner, but I will be drinking margaritas, not coke.